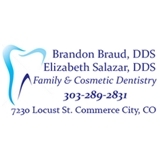 Commerce City Family Dentist (Commerce City) - Book Appointment Online! Love coming here! They always make me feel like family. Don’t plan on changing dentists. The staff there is amazing! Everyone were very patient and concern about your needs.